Last time in KM and TT- Chapter 1, I described how KM and technology transfer are frequently compared as analogous services offered to our faculty. I also described how they are similar. This blog entry describes how they are different. To recap, since the passage of the U.S. Bayh Dole Act enacted on December 12, 1980, (P.L. 96-517, Patent and Trademark Act Amendments of 1980) academic institutions have increasingly supported university-industry partnerships through technology transfer (TT). An entire university-based industry with professional associations has grown world wide including the Association of University Technology Managers and the Alliance for the Commercialization of Canadian Technology. TT seeks to commercialize the results of (mainly) science & technology research that can be patented, licensed to a company and brought to the market in the form of new products and services. In turn the successful company pays the university back in the form of royalties (cash) and equity (in the case of a new company). Assuming readers have a base knowledge of KM (or else why read this blog) I am not going to review KM but suggest you watch our KM presentation here. The table below shows the differences in almost every aspect between KM and TT. This in part reflects the different stages of development of KM and TT as professions but also reflects the fundamental differences in their audiences, processes and objectives. TT is a monetized transaction using a producer push method to find a licensee in a linear process: invention disclosure, due diligence, patenting, technology marketing, license negotiations, license agreement, product development, product marketing, product sales, and royalty payments to university. KM is an iterative process that creates sustained relationships between researchers and research users so that research and evidence can be available to inform decisions. There are no formal tools, formal training nor professional associations for KM (yet). There is a role for the commercialization of (i.e. making money from) social sciences products such as survey instruments and the commercialization of humanities products such as books and films but this is not knowledge mobilization. Stay tuned to this blog for the final entry in this series that discusses a better science & technology analogy for KM. Pingback: Federal Partners in Technology Transfer Welcomes ResearchImpact « Mobilize This! 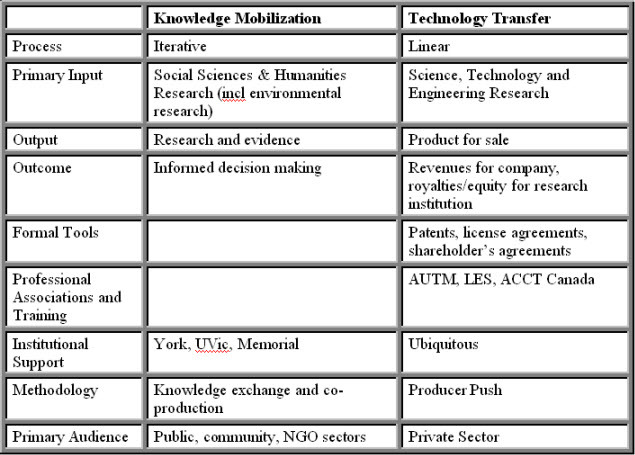 Pingback: Knowledge Mobilization & Technology Transfer – Chapter 3: KM as an emerging paradigm for university-industry engagement (and a shout out to Bea Arthur) « Mobilize This!